I want a trailer that will safely carry my GL 1500 behind another vehicle, but also be light enough to be towed (empty) by that same GL 1500. I have found lightweight trailers but they look like they would beat the tar out of the bike when it was loaded onto it. What do I need to be looking for to be a good dual purpose trailer? I don't think any of those rail style trailers are heavy duty enough to pull a GL1500 on. A flat bed style trailer with solid frame and platform is going to be about to large to pull behind a gold wing. 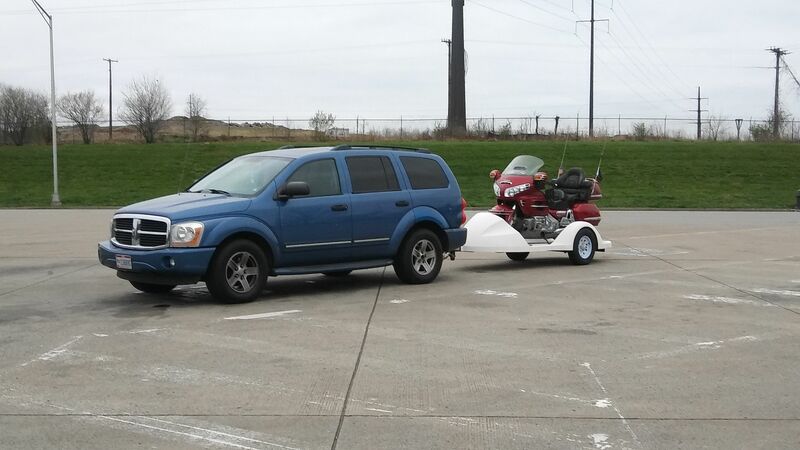 I don't remember who it was, but there was a guy on the GL1800 forum that had an aluminum trailer that he towed large bikes behind his goldwing a couple years ago. I am thinking it was a pretty expensive trailer. Just be careful on the width. couple years ago I saw a pic of a wing pulling a low open sided trailer with a bike on it. I thought I had it in my photo gallery but not there. reason I remembered it was the bike being towed was a Hardly. don't think it was staged because their was other traffic around in the pic. can't remember where I saw it. thanks for your replies. I will keep watching. Fiber Core trailer... used it to tow Wing to Florida.